After a sustainable minor up trend in US Dollar Index starts cracking below 13 EMA after resisting near $81 zone Applying 13,34,55 EMA strategy shows that US dollar Index is <13 EMA < 34 EMA < 55 EMA. 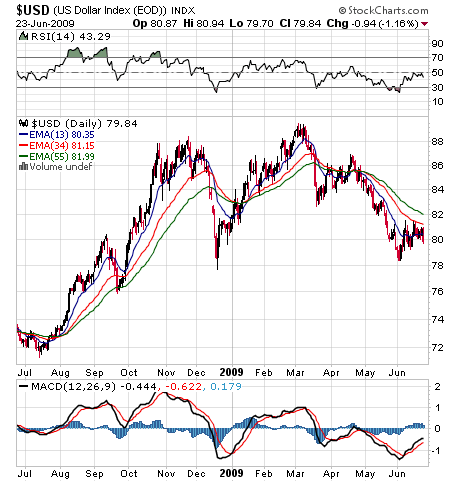 And Indicates that USD Index is in a perfect downtrend. Whats up with our market. Still now there is a perfect inverse correlation with USD Index and Nifty. Right from March 9 onwards USD Index starts the downtrend and so the FII inflows into our market. USD index temporarily stops its downtrend near 78-79 zone.Now the confirmation of sell signal in USD Index confirms the future inflow of FII funds into our market. Now it is safe to assume that 4155 could be strong weekly support. Short term investors could use this an oppurtunity to enter once again to take short term bets.